During the analysis Liquid/Studio shows a 'V' and Mercalli reports error #3. Due to an internal error, Liquid delivers random wrong video frames. In this case the 'V' sign will be shown. Mercalli discontinue the analysis process to avoid further errors. In those cases it might be helpful just to move the Timeline-Cursor within the timeline clip. Then the analysis can be triggered again in the Mercally window. Remove the transitions on this clip! This trick works if the background-rendering is off. See also Link to the NTSC info. Information: the above problem appears with several Matrox graphics boards (RTX). With Mercalli 1.0.9 the issue has been solved. 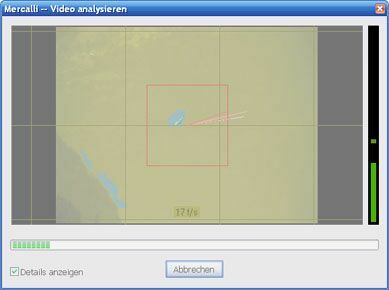 "The Videoanalysis must be executed again" appears in the video preview. How to start the "Videoanalysis" ? If Mercalli is assigned as filter for the first time, the video data needs to be analysed first. For that purpose just mouse click on the button as shown in [Image #1] . The Videoanalysis starts and the text in the video preview disappears. Further information about Analysis and Stabilisation is available in the program's help (Press 'F1' Key to display the help). In spite of multiple installation trys I can´t find the program. In the windows start-menu under "all programs" and "proDAD" I can find the manual only. Where to locate the program? Mercalli can be used as plugin in video editing solutions only. Thus it can be installed as Plugin(s) only. 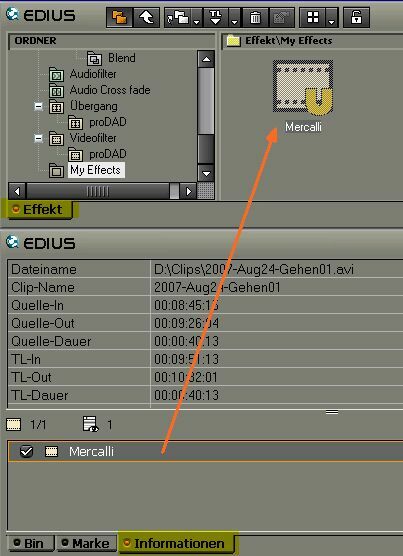 If you can´t locate Mercalli in your NLE as a videofilter, probably your video editing is not compatible for Mercalli. A list of compatible NLEs can be found in the bottom link "Mercalli details" in the box "Plugins available for". Is there a Mercalli version for Ulead Mediastudio available - or will this ever be? The current state of knowledge tells that a Mercalli is impossible or at least combined with strong limitations. Therefore our development department requested a few informations at the manufacturer of this NLE. After these information are being on hand the Mercalli development will be forced. I can´t find my editing solution in the list of supported NLE host applications. Therefore I hope for a kind of standalone version of Mercalli. Will this ever be available? Depending on the demand for a standalone version the availability could be possible. Interests report to the bottom link for further information in future. (Attention: There will be no automatic response but you´ll receive information in future). The plugin interface of Liquid 7.x / Studio 12.x doesn´t pass on several video format relating informations to Plugins, which may give incorrect results with Mercalli. Thus proDAD modified Mercalli from version 1.0.8 with a workaround. Now this Liquig plugin interface limitation can be solved by users intervention defining the video-format in a new menu manually. Always, if the displayed "Video-Format" doesn´t fit with the Liquid project settings, it is assumed that Liquid didn´t pass on the format settings correctly to the plugin. The results are only suboptimal stabilisations or even counterproductive results. In Mercalli under "Video-Format" the same format needs to be choosen as it also appears in the"Sequence" of the used Liquid project. To stabilise NTSC, also a (NTSC) format needs to be selected. 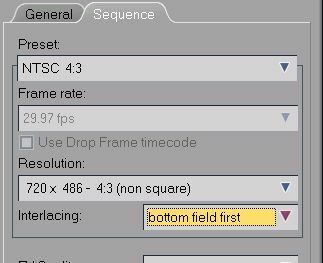 The standard frame priority in Liquid is"Bottom Field First", as in [Image #1] . For a correct function of Mercalli the background rendering of Liquid must be switched off! Sample properties of the NTSC - Sequence in Liquid. These settings must appear in Mercalli too. Else they needs to be set by hand. Adobe Premiere 2.0 and the technichal similar "Elements" versions doesn´t pass on several video format relating informations to Plugins, which may give incorrect results with Mercalli. Thus proDAD modified Mercalli from version 1.0.8 with a workaround. Now this Premiere plugin interface limitation can be solved by users intervention defining the video-format in a new menu manually. 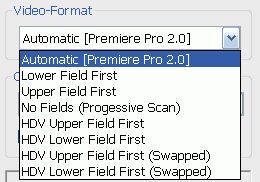 Always, if the displayed "Video-Format" doesn´t fit with the Premier project settings, it is assumed that Premiere didn´t pass on the format settings correctly to the plugin. The results are only suboptimal stabilisations or even counterproductive results. Mercalli choose "Automatic" by default. Hence in most applications using these formats, the results should be satisfactory. Mercalli choose "HDV Upper Field First" by default to solve the most common cases without further necessary user interaction. Because of the above described error, Mercalli can´t self recognise progressive video. Therefore it needs to be setup manually to "No fields". Setting for "Video-Format" on "Automatic" is almost correctly for PAL or NTSC . 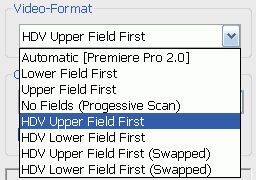 Adequate "Video-Format" setting for for most common HD-Formats:"HDV Upper Field First"
After applying Mercalli the video has been reduced extremely. In addition the borders are very large and shown as blurred areas. How can this be avoided? The right bargraph shows a red bar. What does it mean? During the analysis Mercalli display the jittery intensity as a bargraph. Considerable moves in a video are displayed as larger bars. A red bar is the sign for too intensive moves/jittery and shows, that Mercalli can´t remove these shakes. This can depend on the choosen settings and profiles. Using a better profile resp. settings can affect a remove of these formerly irreperably shakes. For example instead of "smooth tracking shot from a car drive" using "smooth tracking shot from a bumpy car drive" can be more efficient. If the video contains extreme shakes, which are bluring the video, the option "Detect sharpless contents" can be used in addition. This often again obtain better results. Problem: the right bar is red. This is the signal that the current deshake settings or the profile are improperly. 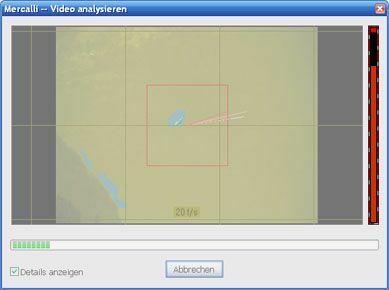 Remedy: After correcting Mercalli´s settings or a correct choosen profile, Mercalli can analyse the video more efficiently (green bar). How does Mercalli stabilise my videoclips? How can I remove undesired shakes in Mercalli (more efficient)? Mercalli analyses every frame of a video clip to determine the undesired vibration and then, automatically conteracts the undesired movement. Source material of a videoclip: In this example, the cross hair has been created only to show the undesired camera movement. The cross hair is now fixed on one point on the ship. To compensate, suceeding video frames need to be moved in reverse direction to the movement. That is why the borders are appearing. These are marked red in this sample for visualisation purposes only. How to eliminate these borders you can see in the next pictures. The border is left black. 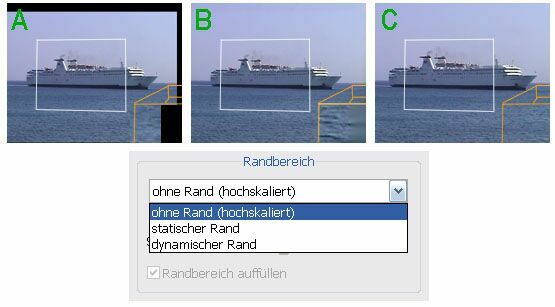 Use this option if you like to scale (magnify) or crop the stabilised video sequence later, using your own editing software. The black border has been removed by a color-blur effect. Use this option if your video has unicolor borders. These adjacent colors will be used to cover the black border. This option is ideal for use with video sequences recorded in water, sky, or underwater etc. The video can be scaled as much as necessary until the borders are completely removed from the video frame. Of course, when a video frame is scaled up, there is always the possibility that blurring will occur. This can be compensated (with limitations) using a sharpness-filter in the NLE.